projects. The federal government owns 38.2 GW at 165 sites (excluding pumped storage). 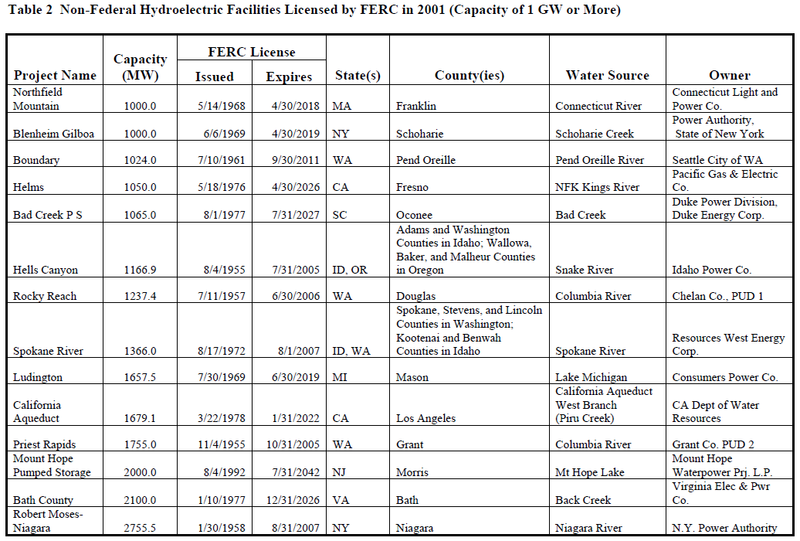 hydroelectric facilities in the country are listed in Table 1 (U.S. Society on Dams). 100 MW of rated capacity. (USACE Hydroelectric Design Center). Grand Coulee (6.8 GW), Hoover (2 GW), and Glen Canyon (1.3 GW). 8 Corps of Engineers dams on the Cumberland River contribute to the TVA power system. shows the 14 largest-capacity hydroelectric facilities licensed by FERC in 2001.